Legendary Philadelphia boxing champion Bernard Hopkins will be awarded with an Honorary Briscoe Medal in recognition of his 2016 retirement. The event will be held on Sunday, October 15, 2017, at Xfinity Live! in South Philadelphia. Hopkins, who ended his storied ring career in December, won world titles in both the middleweight and light heavyweight divisions. His run as middleweight champ included a record 20 title defenses, and important wins over Felix Trinidad, Oscar de la Hoya, Glen Johnson, John David Jackson, Keith Holmes, William Joppy, and many others. 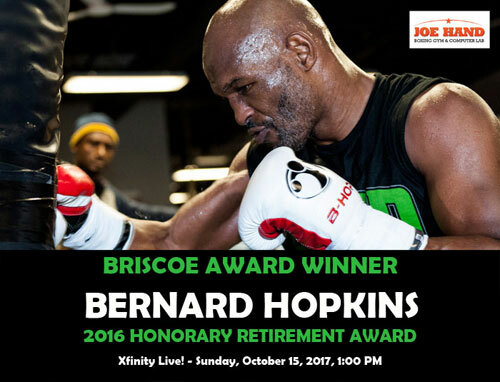 Hopkins was named the “Philly Fighter of the Year” for 2008 at the Briscoe Awards, and returns Sunday for this special honorary award. Hopkins' Honorary Retirement Award is sponsored by the Joe Hand Boxing Gym.